Cycling is not only an environmentally-friendly means of transportation for short journey, but also a recreational activity bringing benefits to physical health. 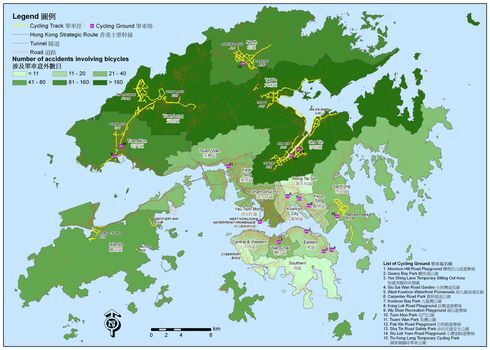 The map shows the distribution of cycling facilities in Hong Kong. Indicated by yellow lines, cycling tracks are mostly located north in new towns in the New Territories. Currently the cycling track network connects adjacent districts, like Sha Tin with Tai Po, and Yuen Long with Tuen Mun. The bike symbols show the locations of cycling ground, which are found also in urban areas. Road safety is an issue of concern in cycling. 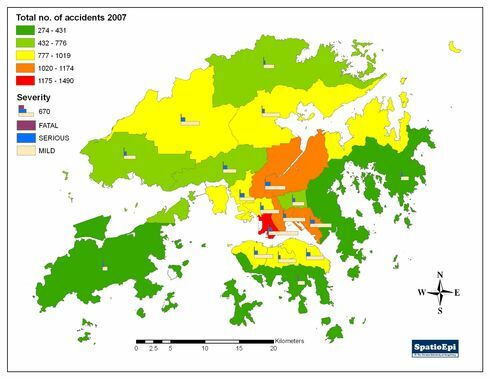 As depicted by graduated colours, greater lengths of cycling tracks in a district was associated with a higher number of bicycle accidents in 2007. 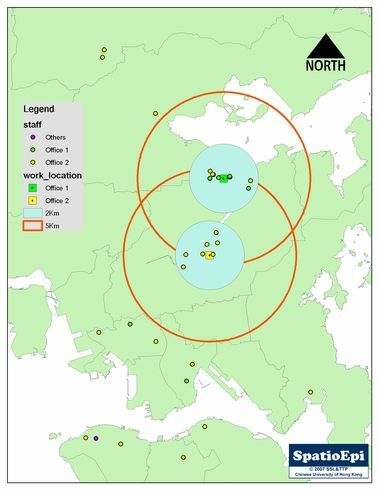 Data for the map were obtained from Lands Department, Leisure and Cultural Services Department (LSCD) and from Legislative Council meeting document. In urban cities, sedentary lifestyle and increased use of vehicles or railways for transportation are associated with diminution of physical activity among citizens. Air pollution and lack of recreational facilities also discourage participation in physical activities.